There was a circular building with three floors. On the first floor lived elderly Mr. Davis and Mrs. Davis. On the second lived a newly-married couple, Sam and Jenny. On the third floor lived Katy, a college student. One day, Mrs. Davis was found dead in their apartment. Mr. Davis decided to question his roommates. Upon questioning , Sam said he was relaxing in a corner of the room while drinking his favorite coffee drink. Jenny said she was applying makeup and getting ready for her high-school reunion. Katy said she was studying for her upcoming exams on Face Time with her friend. Who murdered Mrs. Davis? Sam was the murderer. He said he was drinking coffee in a corner of the room, but the building was a circular building. 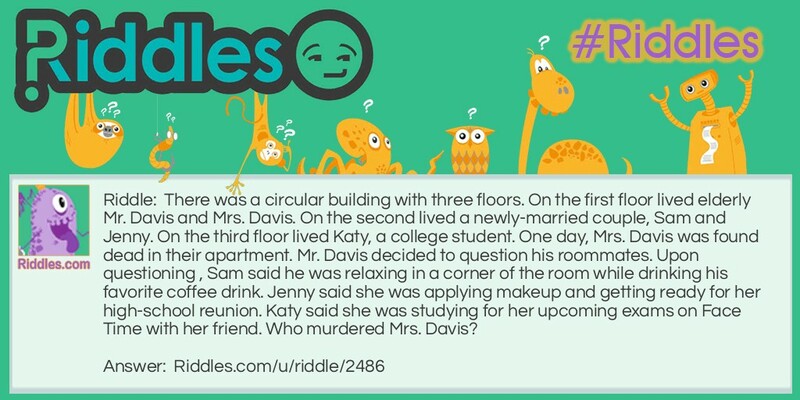 Who Murdered Mrs. Davis? Riddle Meme with riddle and answer page link.